A rare recording of Nirvana was posted yesterday on YouTube. In the audio about 55 minutes you can hear the show that the trio made for exactly 25 years ago - on January 12, 1990 - Portland in a club in the USA. The posting was made by a fan who recorded the concert with his portable recorder. Apparently he found the recording by chance in a box full of old tapes. 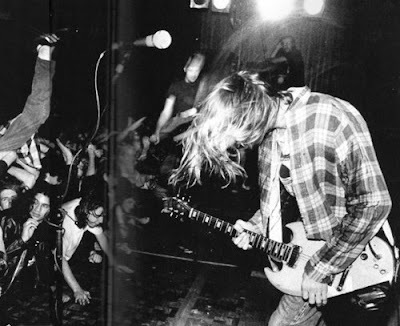 At that time, the band had still not released the album "Bleach" (1989) and Dave Grohl was not yet part of the formation of the group led by Kurt Cobain. In this show, Dale Crover of the Melvins plays drums. Another important fact is that, that was the day that Cobain met Courtney Love, whom he married in 1992. The setlist had in total of 15 songs. In addition to the first album tracks and songs that came out, or would come in singles and compilations, the band also played the then unreleased "Polly (in electric version) and "Breed". Both went into "Nevermind" released in September of the following year and became the trio of the largest and most important band in rock history. The sound quality of the record is not the best - and was probably made by someone in the audience with a tape recorder - but the tape obviously has historical value for fans of the band that broke up in 1994 after Cobain committed suicide.